This article is about the saint. For other uses, see Clotilde (disambiguation). wearing a crown and holding a church; with a battle in the background, in memory of the Battle of Tolbiac. Saint Clotilde (c. 474–545), also known as Clothilde, Clotilda, Clotild, Rotilde etc. (Latin: Chrodechildis, Chlodechildis from Frankish *Hrōþihildi or perhaps *Hlōdihildi, both "famous in battle"; Greek: Moirai Clotho), a princess of the kingdom of Burgundy, supposedly descended from the Gothic king Aþana-reiks, became in 492 the second wife of the Frankish king Clovis I (r. 481–509. The Merovingian dynasty to which her husband belonged ruled Frankish kingdoms for over 200 years (450-758). Venerated as a saint by the Roman Catholic Church as well as by the Eastern Orthodox Church, she played a role in her husband's famous conversion to Catholicism and, in her later years, became known for her almsgiving and penitential works of mercy. She is credited[by whom?] with spreading Catholicism within western Europe. 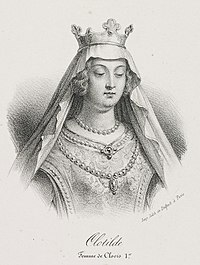 Clotilde was born at the Burgundian court of Lyon, the daughter of King Chilperic II of Burgundy. Upon the death of Chilperic's father King Gondioc in 473, Chilperic and his brothers Gundobad and Godegisel divided their inheritance; Chilperic II apparently reigning at Lyon, Gundobad at Vienne and Godegesil at Geneva. From the sixth century on, the marriage of Clovis and Clotilda was made the theme of epic narratives, in which the original facts were materially altered and the various versions found their way into the works of different Frankish chroniclers. According to Gregory of Tours (538–594), Chilperic II was slain by his brother Gundobad in 493, and his wife drowned with a stone hung around her neck, while of his two daughters, Chrona took the veil and Clotilde was exiled – it is, however, assumed that this tale is apocryphal. Butler's account follows Gregory. After the death of Chilperic, her mother seems to have made her home with Godegisil at Geneva, where her other daughter, Chrona, founded the church of Saint-Victor. Soon after the death of Chilperic, Clovis asked and obtained the hand of Clotilda. They were married in the same year. Ingomer (born and died 494). Chlodomer (495–524), King of the Franks at Orléans from 511. Childebert I (496–558), King of the Franks at Paris from 511. Chlothar I (497–561), King of the Franks at Soissons from 511, King of all Franks from 558. Clotilde (500–531), married Amalaric, King of the Visigoths. Clotilde was brought up in the Catholic faith and did not rest until her husband had abjured paganism and embraced the Catholic Christianity. According to Gregory of Tours' Historia Francorum (History of the Franks), when Clotilde had their first child baptised, he died soon after. Clovis upbraided her; but when Chlodomer was born, she insisted on baptising him also. Although Chlodomer did indeed fall ill, he soon after recovered. More healthy children followed. Clotilde's victory came in 496, when Clovis converted to Catholicism, baptised by Bishop Remigius of Reims on Christmas Day of that year. According to tradition, on the eve of the Battle of Tolbiac against the Alamanni, Clovis prayed to God, swearing to be baptised if he emerged victorious on the battlefield. When he did indeed triumph, Clovis readily took the faith. With him Clotilde built at Paris the Church of the Holy Apostles, afterwards known as the Abbey of St Genevieve. After Clovis' death in 511, she retired to the Abbey of St. Martin at Tours. In 523 Clotilde's sons went to war against her cousin King Sigismund of Burgundy, the son of Gundobad, which led to Sigismund's deposition and imprisonment. Sigismund was assassinated the following year and his body thrown down a well in symbolic retaliation for the deaths of Clotilde's parents. Gregory of Tours claimed – and many others have followed – that Clotilde incited her sons to war as a means to revenge the supposed murder of her parents by Gundobad while others, such as Godefroid Kurth, find this unconvincing and apocryphal. Subsequently, her eldest son Chlodomer was killed during the following Burgundian campaign under Sigismund's successor King Godomar at the Battle of Vézeronce. Her daughter, also named Clotilde, also died about this time. 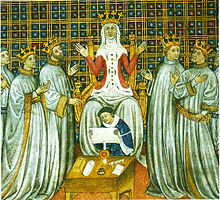 Clotilde tried in vain to protect the rights of her three grandsons, the children of Chlodomer, against the claims of her surviving sons Childebert and Chlothar. Chlothar had two of them killed, while only Clodoald (Cloud) managed to escape and later chose an ecclesiastical career. She was equally unsuccessful in her efforts to prevent the civil discords between her children. After these failures, Clotilde appeared to dedicate herself to a saintly life. She occupied herself with the building of churches and monasteries, preferring to distance herself from the power struggles of the court. Churches associated with her are located at Laon, and Rouen. Clotilde died in 545 at the tomb of St. Martin of Tours, of natural causes; she was buried at her husband's side, in the Church of the Holy Apostles (now the Abbey of St Genevieve). Clotilde's cult made her the patron of queens, widows, brides and those in exile. In Normandy especially she was venerated as the patroness of the lame, those who came to a violent death and women who suffered from ill-tempered husbands. In art she is often depicted presiding over the baptism of Clovis, or as a suppliant at the shrine of Saint Martin. Several fine images of her remain, particularly in the 16th century stained glass window at Andelys. Her relics survived the French Revolution, and are housed in the Église Saint-Leu-Saint-Gilles in Paris. Clotilde is the patron saint of Les Andelys, Normandy. In 511, the Queen founded a convent for young girls of the nobility there, which was destroyed by the Normans in 911. In its place was erected Our Lady’s Collegiate Church, which contains a statue of Saint Clotilde. Also in Les Andelys is Saint Clotilde's Fountain. The spring is popularly believed to heal skin diseases. ^ Gregory of Tours, Historia Francorum, "Now the king of the Burgundians was Gundevech, of the family of king Athanaric the persecutor, whom we have mentioned before." ^ Wood, Ian (2014) . The Merovingian Kingdoms 450 - 751. London: Routledge. ISBN 9781317871163. Retrieved 16 Mar 2019. ^ a b Online, Catholic. "St. Clotilde – Saints & Angels – Catholic Online". Catholic Online. Retrieved 2017-11-29. St. Clotilde (c. 474- 545) and her husband King Clovis (c. 466-511) founded the Merovingian dynasty, which ruled the Franks for over 200 years. [...] She died at the tomb of St. Martin of Tours and was buried in Sainte-Genevieve in Paris [...]. ^ a b "Clotilda, Saint" . Encyclopædia Britannica. 6 (11th ed.). 1911. p. 557. ^ a b Farmer, David Hugh (1997). The Oxford dictionary of saints (4. ed.). Oxford [u.a. ]: Oxford Univ. Press. ISBN 9780192800589. ^ "Saint Clotilda". Saints.SQPN.com. Retrieved 2012-07-13. Wikimedia Commons has media related to Sainte Clothilde. This article incorporates text from a publication now in the public domain: Chisholm, Hugh, ed. (1911). "Clotilda, Saint" . Encyclopædia Britannica. 6 (11th ed.). Cambridge University Press. p. 557. The Burgundians were a large East Germanic tribe or group of tribes that lived in the time of the Roman Empire in the region of Germania, that is now part of Poland. Year 511 (DXI) was a common year starting on Saturday of the Julian calendar. At the time, it was known as the Year of the Consulship of Felix and Secundinus. The denomination 511 for this year has been used since the early medieval period, when the Anno Domini calendar era became the prevalent method in Europe for naming years. Clovis was the first king of the Franks to unite all of the Frankish tribes under one ruler, changing the form of leadership from a group of royal chieftains to rule by a single king and ensuring that the kingship was passed down to his heirs. He is considered to have been the founder of the Merovingian dynasty, which ruled the Frankish kingdom for the next two centuries. Theuderic I was the Merovingian king of Metz, Rheims, or Austrasia—as it is variously called—from 511 to 533 or 534. Chlothar II, called the Great or the Young, was King of Neustria and King of the Franks, and the son of Chilperic I and his third wife, Fredegund. He started his reign as an infant under the regency of his mother, who was in an uneasy alliance with Clothar's uncle Guntram, King of Burgundy. Clothar assumed full power over Neustria upon the death of his mother, in 597; though rich this was one of the smallest portions of Francia. He continued his mother's feud with Queen Brunhilda of Austrasia with equal viciousness and bloodshed, finally achieving her execution in an especially brutal manner in 613, after winning the battle that enabled Chlothar to unite Francia under his rule. Like his father, he built up his territories by moving in after the deaths of other kings. 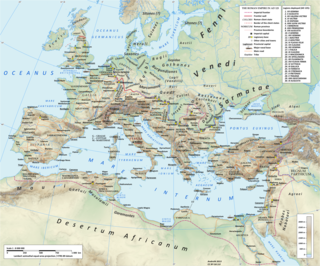 Neustria, or Neustrasia, was the western part of the Kingdom of the Franks. Chlothar I, also called "Clotaire I" and the Old, King of the Franks, was one of the four sons of Clovis I of the Merovingian dynasty. Childebert I was a Frankish King of the Merovingian dynasty, as third of the four sons of Clovis I who shared the kingdom of the Franks upon their father's death in 511. He was one of the sons of Saint Clotilda, born at Reims. He reigned as King of Paris from 511 to 558 and Orléans from 524 to 558. Gundobad was King of the Burgundians, succeeding his father Gundioc of Burgundy. Previous to this, he had been a Patrician of the moribund Western Roman Empire in 472 – 473, three years before its collapse, succeeding his uncle Ricimer. He is perhaps best known today as the probable issuer of the Lex Burgundionum legal codes, which synthesized Roman law with ancient Germanic customs. He was the husband of Caretene. Sigismund was King of the Burgundians from 516 to his death. He was the son of king Gundobad and Caretene. He succeeded his father in 516. Sigismund and his brother Godomar were defeated in battle by Clovis' sons and Godomar fled. Sigismund was taken by Chlodomer, King of Orléans, where he was kept as a prisoner. Later he, his wife and children were executed. Godomar then rallied the Burgundian army and won back his kingdom. Chlodomer, also spelled Clodomir or Clodomer was the second of the four sons of Clovis I, King of the Franks. On the death of his father, in 511, he divided the kingdom of the Franks with his three brothers: Theuderic I, Childebert I, and Clotaire I. Although Theuderic, the eldest, had a better claim, Chlodomer divided half of the kingdom with his two other brothers. This was the kingdom of Orléans, taken from the former kingdom of Syagrius. This kingdom included, most notably, the bishoprics of Tours, Poitiers and Orléans. Chlodomer married Guntheuc, with whom he had three sons: Theodebald, Gunthar, and Clodoald. Saint Gontrand, also called Gontran, Gontram, Guntram, Gunthram, Gunthchramn, and Guntramnus, was the king of the Kingdom of Orleans from AD 561 to AD 592. He was the third eldest and second eldest surviving son of Chlothar I and Ingunda. On his father's death in 561, he became king of a fourth of the Kingdom of the Franks, and made his capital at Orléans. The name "Gontrand" denotes "war raven". 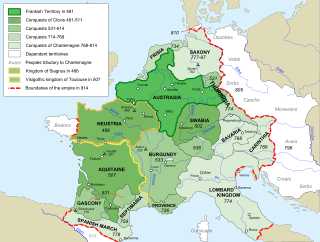 The Kingdom of the Burgundians or First Kingdom of Burgundy was established by Germanic Burgundians in the Rhineland and then in Savoy in the 5th century.